A reading system that gives you the necessary ammo to deliver a highly effective private reading for paying clients. Have you ever wanted to be able to deliver a quick or full-blown reading for members of your audience or clients using something you carry every day, especially if you are a magician or mentalist? If you are a magician or mentalist, have you ever considered maximizing the impact your card effect has on your audience, by giving your spectator a quick reading about themselves? 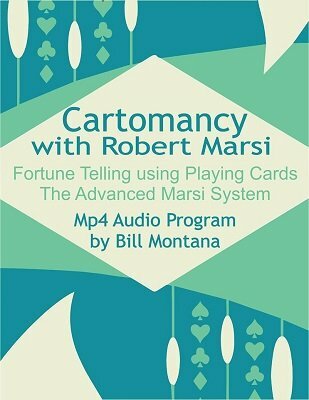 In Cartomancy: Fortune Telling Using Playing Cards , Robert Marsi is joined by host Bill Montana and Mystic Alexandre, to deliver a complete MP3 audio training regarding Cartomancy. This reading system has fascinated Robert all of his life and continues his research to this day. Robert is about to give you a highly effective reading system that has treated him (and his clients) so well. In this audio training, you will learn about the history of Cartomancy, amazing stories regarding Cartomancy, two systems of Cartomancy (traditional and modern-day), and spreads. You will learn spreads easy for a performer to learn and use. Also, you will learn Bill Montana's previously unpublished "Heaven and Hell" spread that will enable you to give you quick or full readings for your client. Robert has also included how he presents Cartomancy at home psychic parties, corporate events, including an effect he kept underground all these years! What do you get in this system? You will receive is a 2.5 hour MP3 audio training containing many insights and two supporting PDF cheat sheets that will make learning Cartomancy easier. Using the information on these PDF's, and an idea presented in the audio training, you can go out and start giving Cartomancy readings as soon as today! Get Cartomancy right now and do it the right way. 1st edition 2016, length 2.5h. I already bought Julian Moore's Cartomancy, it was great, I learned my card reading skill from the book. I saw this book's advertise on magiccafe. I want to learn more on cartomancy so I bought this product, but after I received the product, I was very upset, totally waste of money. Very Poor quality product, the MP3 file is very poor recording quality with a lot of noise, only 2 pages of PDF file, and charging for 35 US dollars...I just can't believe this is what I bought. Sorry I learned nothing from it and was pissed off. Really disappointed. This product should not be published. I would not buy anything from this author anymore. I would recommend those who want to learn cartomancy to buy Julian Moore's book.